John Beecher was born in New York, the great-great-nephew of Abolitionists Harriet Beecher Stowe and Henry Ward Beecher; it was a heritage his life would honor. He grew up in Birmingham, Alabama, where his father was a U.S. Steel executive, but Beecher entered the industry at the bottom. From age 16, he worked twelve-hour shifts on the open hearth furnaces. Educated at Cornell, Alabama, Harvard, and North Carolina, Beecher worked eight years during the New Deal era as a field administrator of social programs devoted to sharecroppers and migrant workers. He then took up a teaching career. But when he refused to sign California's unconstitutional "loyalty" oath in 1950, he was fired and blacklisted. He began ranching in the redwoods, and, along with his wife Barbara, founded a press to publish himself and other blacklisted writers. During the civil rights movement he became a Southern correspondent for Ramparts and the San Francisco Chronicle. In 1977, nearly 30 years after being fired, he was reappointed to the San Francisco State University faculty. 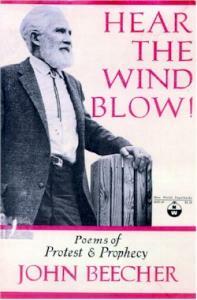 See his Collected Poems 1924-1974 (1974). Cary Nelson: On "Beaufort Tides"
Jim Beatty: The Economics of Race Relations in John Beecher’s "Beaufort Tides"
John Marsh: On "Report to the Stockholders"
John Beecher: "An Arizona Printer Speaks Up"